Trongsa is the ancestral seat of the Wangchuk Dynasty from whence the First King was elected. The Second King Jigme Wangchuk ruled the country from Kuenga Chholing in Trongsa during winters. In keeping with tradition the Crown Prince of Bhutan holds the position of the Trongsa Penlop prior to ascending the throne. The present King was appointed Penlop in 1972, shortly before his coronation. This stupa designed after Swayambunath in Katmandu is on the road to Trongsa from Wangdue. Lama Shida built it in 18th century, to supposedly suppress the remains of an evil spirit subdued at the spot. It is an ideal place for picnic lunch or to simply take a break from driving. The massive dzong dominates the entire vista of the town. It stretches on a ridge leaving the only way, in old days, to traverse the valley through the dzong. This gave a unique advantage in keeping control over what passed through and between the valleys, especially during the time of civil strife ending in the 19th century. Of course, the road is now carved into previously inaccessible cliffs. Initially built in 1648 and expanded in later years, it was the seat of the most powerful governor in the country with influences that stretched all the way to the east. Both the first and second King ruled the country from this ancient seat. The Dzong is a labyrinth of temples, stairways, corridors and district offices; it has 21 temples. It is built on many levels following the contours of a ridge. Located above the dzong and the quaint Trongsa town is the remaining main Ta Dzong, the watchtower. It now houses few monks and a temple dedicated to the epic hero and warrior, King Gesar of Ling. 23 kms from Trongsa along the central-south highway is Kuenga Rabten, the winter palace of the second King. 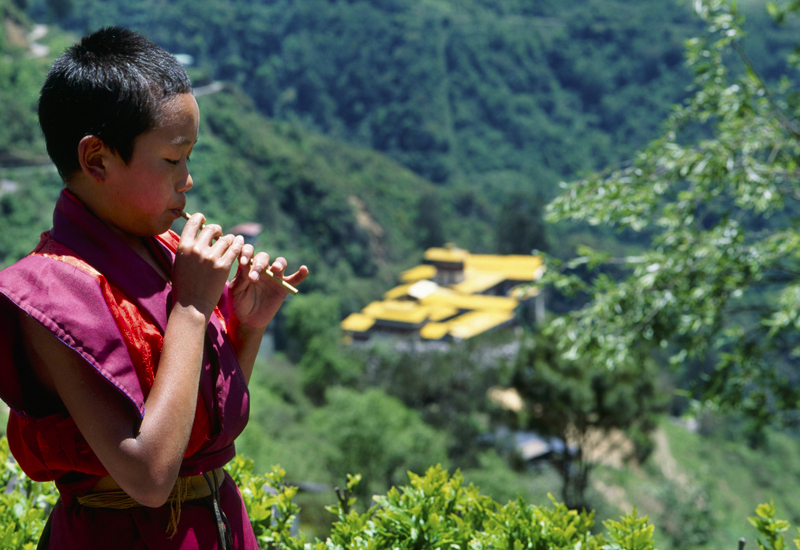 It is a pleasant half-day trip from Trongsa and offers a good insight into the early days of Bhutanese Royalty.